Café Del Manolo: New Cups! I was out with today and got bit by the cup collecting bug again! I found some really interesting espresso cups dating back a few years. 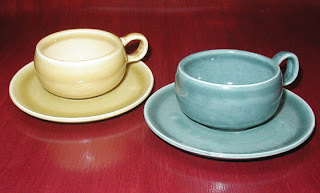 The first find was a pair of Russel Wright designed cups from the 40's-50's. 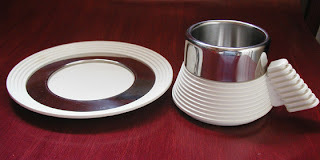 They are Demitasse cups that were part of his American Modern dinnerware line. I just love these cups. I saw the retrospective of his designs at the Cooper-Hewitt design museum in NYC in 2001 and I saw these there. I was blown away by the work. There is a book available from that show, highly recommended. The second find, was a set of 4 Carlo Giannini cups that it am guessing are from the 60's-70's. These are truly unique cups. I have never seen anything like them. They are very futuristic and the design is very original. They look like they came right of the Jetsons. They are mad from Stainless Steel and a Plastic. I couldn't leave these puppies behind.